BBC is making a Grand Theft Auto drama. So explosions, hookers, heists and bloody tales of revenge are all in store, right? Not quite. This 90-minute show, tentatively titled "Game Changer," is instead focused on the making of the popular open-world gaming franchise and how its creators persevered against anti-violence activists and politicians who wanted their games banned from store shelves. Details on the show have been a bit murky thus far, but today, BBC announced that some big names will play the lead roles in the show. Daniel Radcliffe, of Harry Potter fame, will step into the shoes of Rockstar co-founder Sam Houser, who has been a driving force behind the GTA series. Bill Paxton, who you'll recognize from the films Apollo 13, Twister and Aliens, plays anti-violence activist Jack Thompson. 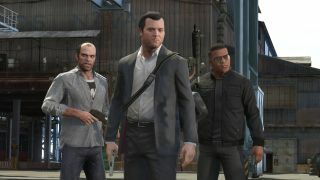 Thompson was central in the attempts to ban violent video games, with GTA and several other Rockstar games being the prime targets.